Here in Arizona today we are 112 degrees!! So I made this sunny Thank You card. I got the sketch from a peachy keen stamp release challenge. what a great take on our Fun In The Sun challenge at BBTB2. Thanks for joining us. PS, I am in this 112 AZ heat too. Bummer huh? Yes. It's miserable when it's this hot!! Very cute card. I love the sun! Try to stay cool! This turned out very cute. Stay cool. 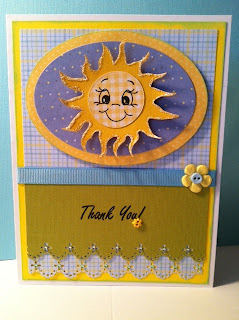 What a fun card for the Sun challenge at BBTB2. Love the PK face and the bright colors. The layering on the bottom is so pretty. Thanks for joining us. I'm in Gilbert and April live in Laveen. Where in Phx are you? Thanks!! Great card; love the PK face on the sun. Very cheery card!--Pat N.
What a fun card - your gingham sun makes me smile! Thank you for joining us in the weekly challenge at BBTB2! Great summer card, love it! What an adorable card. TFS. Glad you had the cartridge. Thanks! Really cute card. I love the purple paper you chose behind the sun. This is a very cute card! I really love the colors and the smile on that sun is adorable! I really like Peachy Keen Stamps. Thanks Jo!! What a sweet sun and fun colors! Thanks so much for playing at the Go Fish Challenge! Very cute! Love the smiling sun! Thanks for sharing with us at BBTB2! Very cute. Love the face you put on your sun. Thanks for playing at BBTB2. Thanks for stopping by my blog Tara- I am a new follower of yours too! So cute and fun.Thanks for joining us at BBTB2. Adorable card. You're right about the AZ heat. I'm in Maricopa County and we have had next to no rain in our particular area...keeps me right in my house stamping the day away. Thanks for playing with us at Simply Create Too in our Summer Vacation challenge no. 17. Join us again soon. Thanks for entering your card at Peachy Keen's Challenge this week. Darling sun with the patterned paper. This is a very sweet card, Tara! Beautiful color scheme, and that face on your sunshine is adorable! Nicely done, and thanks so much for joining us for the PKS Challenge! so darling! love that cute little face on the sun. Thanks for sharing your creativity with us at BBTB2! Adorable Card. Love the color and the PKS Face. Thank you so much for joining us over at GoFish! Challenge. Wow u sure have a nack 4 making a card look so realistic, this on w/Sooo many of the sun's rays, making the suns heat real HOT, cute ideas!